After a four-year hiatus, Terry Gilliam (The Brothers Grimm, Fear and Loathing in Las Vegas, Twelve Monkeys), a filmmaker known both for his boundless imagination and his non-commercial instincts, returns with The Imaginarium of Doctor Parnassus, a wildly inventive, and deliriously surreal, unfocused, uneven fantasy/romance. The Imaginarium of Doctor Parnassus is also Heath Ledger’s last film, and it remained unfinished at the time of his death in 2008. Improvising, Johnny Depp, Jude Law, and Colin Farrell stepped in as Ledger’s many-sided character for Gilliam’s unconventional meditation on age, death, and the power of storytelling. The Imaginarium of Doctor Parnassus centers on a modern-day troupe of traveling performers in London. Led by Doctor Parnassus (Christopher Plummer), a 1,000-year-old alcoholic and inveterate gambler who long ago made a bargain with Mr. Nick (Tom Waits), the Devil. The troupe includes his teenage daughter, Valentina (Lily Cole); Anton (Andrew Garfield), a young man infatuated with Valentina; and Percy (Verne Troyer), Doctor Parnassus’ long-suffering assistant and friend. They travel in a horse-drawn wagon that serves as their home, and when they’re working it, unfurls into a stage, with Parnassus promising members of their usually thin, slightly bemused audience a trip into his imagination for a small fee. With Valentina’s 16th-birthday approaching, the terms of Parnassus’ deal with Mr. Nick — his youth in exchange for his daughter on her 16th birthday — are on the verge of being fulfilled. Parnassus understandably frets at losing the daughter, but Mr. Nick offers him another wager: Valentina’s freedom if Parnassus can acquire five “good” souls before Mr. Nick acquires five of his own. The wager becomes more complicated when Anton and Valentina save Tony Shephard (Heath Ledger) from hanging. Tony becomes the fifth member of Doctor Parnassus’ troupe, which makes the smitten Valentina happy and Anton understandably unhappy. 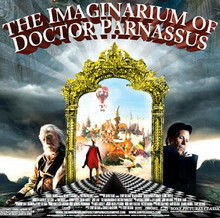 As The Imaginarium of Doctor Parnassus unfolds, Gilliam and his co-screenwriter, Charles McKeon (The Adventures of Baron Munchausen, Brazil) drop clues about Tony’s identity and his motivation for joining the troupe, which helps to explain the character’s transformation inside the Imaginarium. The switch in actors inside the Imaginarium from Johnny Depp (in the shortest sequence, due to his limited schedule) to Jude Law and finally to Colin Farrell (in the longest sequence) works smoothly. While other characters don’t change inside the Imaginarium, Tony does, presumably because his true nature gradually reveals itself with each visit to the Imaginarium. Other characters visit once, unchanged). The narrative justification for the switch, however, isn’t readily apparent, which might cause confusion among moviegoers, as will the shifting terms of the wager between Doctor Parnassus and Mr. Nick who, at least in Gilliam’s interpretation, isn’t the embodiment of evil found in Christianity, but more of a trickster god. He’s devious and cunning, but also sees Parnassus as a friend then, or at least as a companion to make eternity bearable. Gilliam, of course, asks a great deal from his audience, an audience he readily acknowledges might be uninterested in 19th- or 20th-century forms of storytelling — literature, poetry, myths. Gilliam also crams The Imaginarium of Doctor Parnassus with an overabundance of visual ideas, including a candy-colored world crammed with giant shoes, cloud-reaching ladders, and a bleak promontory. Thematic concerns of aging, mortality, creativity, rejection, and the fundamental importance of storytelling are also abundant. It shouldn’t come as a surprise to anyone even tangentially familiar with his work, but at least here, it’s all the more commendable, if not as a masterpiece by a master filmmaker, then a worthy effort by a filmmaker undaunted by the vicissitudes of making independent films in the 21st century.